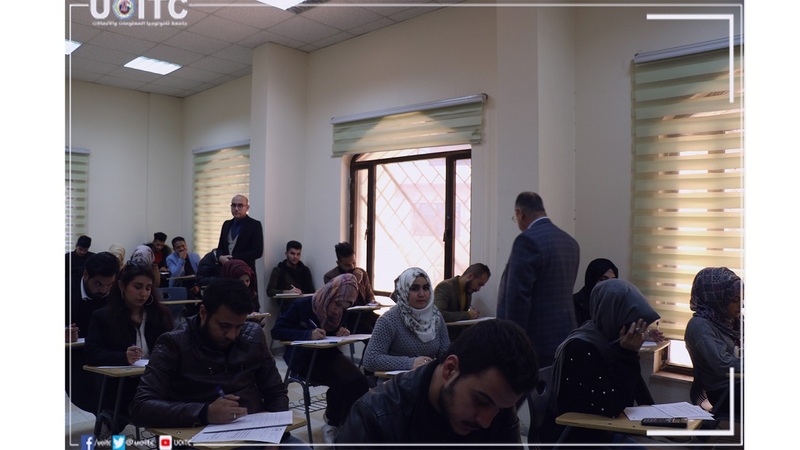 University President Followed up the Progression of Quarterly Exams at the Business Informatics College.. The President of the UOITC, Dr. Abbas M. Al-Bakry conducted an inspection tour to the classrooms of the quarterly examinations for the academic year 2018-2019 at the BIC. Dr. Al-Bakry, was accompanied by Dean of Business Informatics College Dr. Safaa A. Al-Mamouri and Scientific Affair Assistant of the University President Dr. Jane J. Stephan. During his tour in the classrooms, he emphasized on the necessity of introducing the appropriate situations and preparing all the requirements that lead to success in the first semester tests for completing them perfectly. He also advised the students to persevere and excel in their academic life and achieve success in their quarterly exams.